Islands! Model the different ways islands form, and explore the implications for island structure. Examine the physical properties of sand, and the biology and chemistry of coral reef formation. 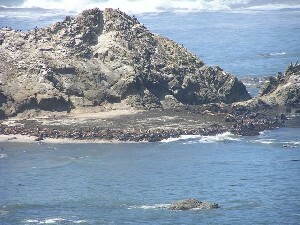 Learn about many of the organisms that take advantage of the isolation of islands for breeding, such as elephant seals and birds. Learn about dispersal and colonization of islands, and island biogeography. Investigate cell biology and DNA, adaptation and natural selection. Study some of the animals in the waters around islands, from plankton to sharks. Apply what you learn to issues of management unique to island environments. This material is based upon work supported by the National Science Foundation under Grant Nos. 0338153 and 0638731. Any opinions, findings, and conclusions or recommendations expressed in this material are those of the author(s) and do not necessarily reflect the views of the National Science Foundation.